I'm a cat so I naturally get sad when a cat gets hurt or is sick. I'm also an INDOOR cat so it pains me that so many kitty tragedies can be prevented by keeping your cats in the house. At least once a week, one of my Twitter anipals is injured—hit by a car, hurt by a larger animal (like it or not, we're near the bottom of the food chain, right above the rabbit), or hurt or poisoned by some screwball human piece of trash. Then, there's the illnesses and infections your cat can contract. The truth is: a house cat's life span is so much longer than one who goes outside. If you're a cat in a warm, safe home, with loving peeps and all the food you could eat, why would you want to go out? When TW and Pop took Nicky (photo) off the street, they used to let him go out in the backyard. Then he started to gain weight and they discovered he was eating at every house where they left food out for strays. There wasn't a "Happy Hour" that he didn't partake in. Soon, he couldn't out-run other cats and every time my peeps heard cats fighting, Nicky would come in bruised and banged up. Finally, he came limping in with an abscessed foot and had to be rushed to the V-E-T. That was the last time he left the house without a carrying case. My peeps found out the hard way. Then there's the story of the neighbors that used to buy expensive angora and Persian kitties only to leave them wandering the streets and yards. Ann Gora was one of these cats; a real sweetie who was starved for attention and affection. Ann started spending more and more time in my peeps' yard so my peeps started feeding her. Then winter came and she basically lived under their back porch in a little shelter set up for her. TW and Pop didn't want to take her in because she belonged to someone and they might get mad. Not that they'd even care since they had bought a silver angora, which they named—you're not going to believe this—Babydoll Loverboy!!! After paying $400 for this cat, they used to let him out too. Well, winter turned to Spring and little Ann's beautiful, long fur became a matted mess but she was as lovable as ever. TW and Pop could take no more when they saw that one side of her fur had completely ripped away from her body. TW called her friend who worked for a shelter down in South Jersey and she came up and took Ann to Tom's River. They shaved Ann Gora, fixed her up and she was adopted out to a furever home, where, hopefully, they kept her indoors and gave her a lot of love. The moral of this story is not to give in when we cry to go out. Cats are warm-weather creatures from countries like Persia (Iran), Burma, Egypt, etc. where they don't have a lot of cold weather or cars screaming down the highways. Unless, you have one of those outdoor kitty enclosures, please keep us safe in the house. We'll purr—well most cats will—and love you for it. That's excellent advice, CK! At my old apartment the downstairs neighbors and their kids always left the back door open. Because I know that Topaz is an adventurous cat, I was always afraid she'd get outside and get hurt or lost. Although my boyfriend tried explaining that to the neighbors, they wouldn't listen. The mom even went so far as to tell the landlord that my boyfriend was being confrontational and unresonable with her with regard to keeping the back door shut. That is so sad, Michelle that people don't have enough sense to keep their cats inside where they'll be safe and warm. You is so rite bout that. 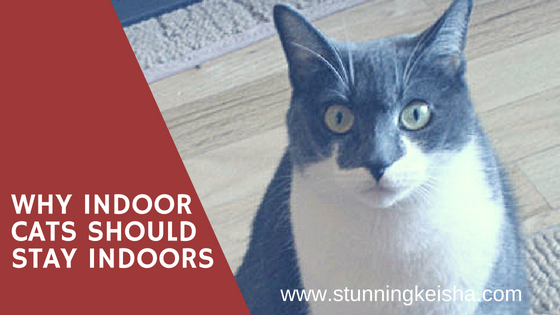 We see so many tragedies with kittehs wot is let outdoors. Mom will not adopt kittehs to peeples wot lets them outside even if'n they say "only under supervishun." Has you ever tried to catch a kitteh wot freaks out and bolts? Like mom says, we reskoo them from outside, why would we send them back outside? Iz like letting your toddler go play in the street. Ooh thank you for talking about outdoor cat enclosures and how important it is to the safety of kitties to be indoor kitties. cuz pets need sun & fresh air without the dangers of roaming free.